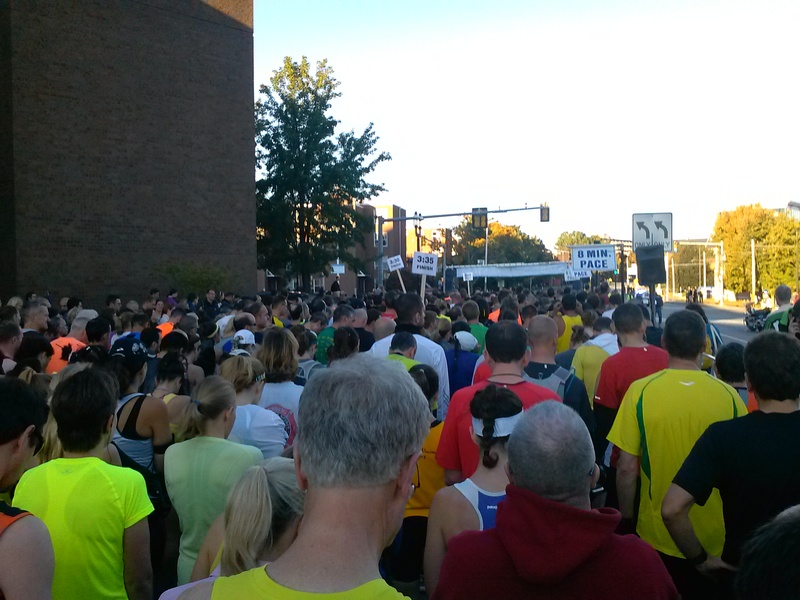 Over the summer, I received an e-mail form my track club (AARC) saying that the Baystate Marathon in Lowell, Mass., was looking for volunteers to lead pace groups. Since my wife , Julia, and I are always looking for an excuse to run long, we knew immediately that we wanted to volunteer for this. 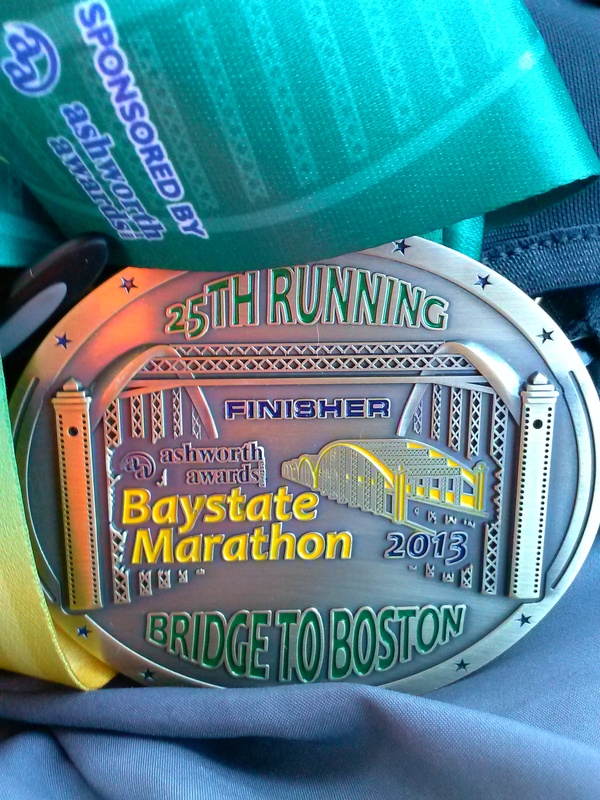 The Baystate Marathon is a flat, fast course known regionally for qualifying 25% of its runners for Boston (I attempted to hit my own BQ there several years ago, but missed by about 12 minutes), so pace groups are especially important for getting as many runners to their BQ as possible. The morning of the marathon was chilly but beautiful. 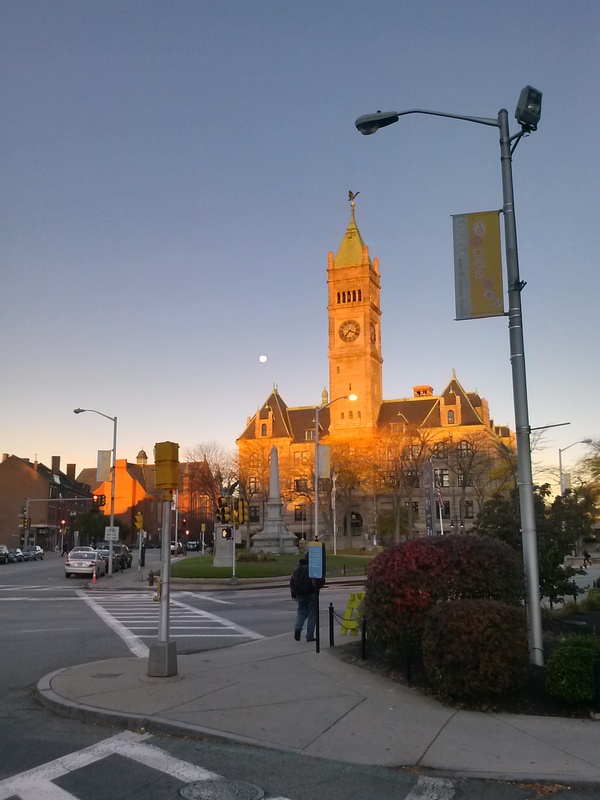 A nearly full moon lit the early morning sky and the sun quickly warmed the air. After a short drive from Manchester, a quick check-in and a few bathroom stops, we donned our blaze-orange shirts and lined up at the start line with our 3:45 pace sign. Without the normal anxiety that accompanies racing, we were free to mingle with the many runners around us who were nervous. Another member of our track club, Ernesto, was leading the group in front of us to a 3:30 finish. We chatted with him briefly before honing in on our spot in the start coral and answering questions about running in the pace group. Most people asked whether we would run a steady pace or follow some other tactic for finishing in the set time frame. Julia and I had already decided it would be in the best interest of everyone wanting to use our pace group if ran consistent 8:30 splits throughout the duration, so we let everyone know that. When the starting gun went off, we were careful not to let the group get carried away with the initial rush that comes at the start of every race. We eased into our assigned 8:30 pace. It took a little getting used to, but we quickly found our groove at the slower-than-usual speed and settled in with the runners around us. Julia and I used each other as sounding boards to make sure we were sticking to the best pace for the group. The weather only got better as the morning progressed and my wife chatted with some of the other ladies at the front of the group. We rolled easily along the Merrimack River and finished the first loop of the course. As we came into the last 10 or so miles of the course, I began checking on the status of different portions of the group, seeing if anyone needed energy gels, encouraging runners to drink water and to stick with the pace. With about eight miles to go, we picked up the 3rd member of our pace group, Curt, who was out there for a good run and to make sure Ernesto, Julia and I were all set. Because Julia, Ernesto and I all wanted to run the full marathon, he graciously agreed to spot us for the last half of the race. He had picked up Ernesto around mile 15 and then ran with us to the end. The final miles of the race went smoothly and we encouraged as many runners to stick with the pace as possible. Julia took several of the ladies we had been running with ahead, for a faster finish, while Curt and I hung back at the 8:30 pace. I ran into a fellow Airman from Westover ARB around mile 23 who had been experiencing some serious cramping in his legs since mile 10. He hooked up with us and ran with the pace group to the end (and knocked over an hour off his previous PR!). After 26.2 miles, Julia, Curt and I brought our group in right on schedule. My Garmin showed a total elapsed time of 3:44;53. One funny thing that happened throughout the course of the race involved our pace group sign. It was a 3-ft, 1″x2″ stick with a laminated pace sign on the top. When we started, Julia and I planned to toss it at the designated water stop. However, by the time we realized we could get rid of it, it had become a matter of pride to continue holding it. We ended up taking turns with the sign throughout the entire race and brought it home at the end of the day! Following the race, we had many runners come to us and thank us for helping them reach their goals. It was extremely rewarding and humbling to know we played a small part in helping other runners achieve the goals they had worked for months and years to accomplish. The opportunity to pace was rewarding in other ways as well. Contributing to the running community as a whole, and not just worrying about my own goals, was a great, reinvigorating feeling. It helped reinforce to me that running is about more than PRs. It’s about the community of runners, the shared experience and the indelible memories you form with loved ones when you do something crazy like running a marathon. How cool! Are there other tactics for pacing? You mentioned you wanted to run steady splits, but to some pacers speed up/slow down? It was a lot of fun. I’m not sure if some pacers do this, but you could always run a negative split pace, where you run the first half at a slightly slower pace and speed up to a faster pace for the second half. I think in the interest of serving many different running abilities, a consistent pace is probably the fairest way to pace. Are you thinking about pacing or using a pacer?